Compact E-Drum Set at a bargain price! Compact e-drum set with velocity sensitivity! E-Drums are certainly the most versatile drum sets. With an E-Drum kit you are well prepared for every musical situation and every acoustic environment, because not only the volume can be adjusted in the blink of an eye, but also the overall sound can be changed at lightning speed - if necessary, even within a song. In the past, e-drums were mainly limited to synthetic sounds, but today they mostly work with samples that reproduce drums, cymbals and percussion sounds realistically. And thanks to the drum pads' modern head design, even the playing feel is identical to that of an acoustic drum set, just like with the cymbal pads, which are mounted in similar fashion as real cymbals. The early synthetic sounds are, of course, also on board, although there are now even sound modules again that specialize purely in electronics. There's also a lot of gear to upgrade your acoustic drum set to a hybrid set that combines the best of both worlds. As with acoustic drums, many manufacturers offer their E-Drumsets as a complete package, including all drum and cymbal pads as well as all necessary hardware including the so-called Brains (the sound module). A pedal for the kick pad (the bass drum) is sometimes included, but a throne and sticks usually have to be purchased separately - we are happy to help here and also have sets on offer that include all the important parts for small money. The best playing feel is offered by drum pads that are equipped with mesh heads, because these are the closest to normal drumheads. 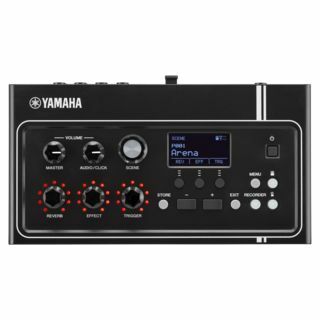 But also the drum pads, which are equipped with rubber-like surfaces, now have a good to very good playing feel, for example the Yamaha top series. 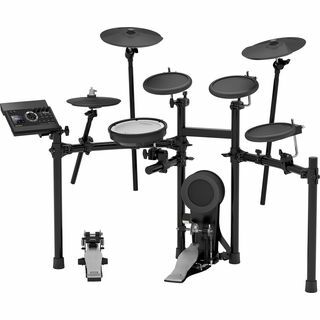 There is a slight difference between the hardware and an acoustic drum set: here a so-called drum rack has proven itself compared to single tripods, which not only simplifies the assembly but also the transport of the e-drums. Under this term we have summarized everything that accommodates drum and percussion sounds in a single device and can still be played with sticks or the hands or fingers. 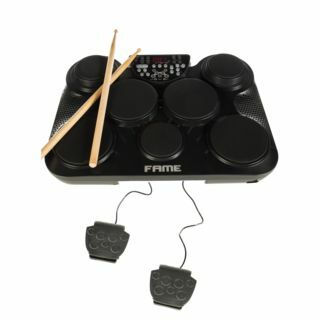 Here you will find everything your heart desires, from a mini drumset for making music under the Christmas tree to an extensively equipped percussion pad. Digital drums combine pads and sound generation in one device, so they are ideal for either simulating a drum set in the smallest of spaces or expanding an acoustic drum set with sounds that acoustic drums simply can't deliver. These can be percussion sounds like shakers, tambourines or cowbells, but also wacky electronic sounds. Many digital drums also have connectors for additional external pads and even pedals, so you can play bass drums and hi-hats with your feet. Drum computers are the ideal companion (in a double sense of the word) for anyone who needs a drummer that can be stored in a backpack. If you can't or don't want to play drums yourself, but need something that delivers grooves for your songs at any time (and at any volume), you've come to the right place. But even as a drummer you can be inspired by the internal preset grooves or program your dream grooves yourself with the integrated mini pads - don't worry, a drum computer corrects notes played too early or too late with its Quantize function and puts them in the right place. Almost all components of an e-drumset can be purchased separately in order to extend and individually expand the set. Many sound modules already offer connections for additional drum and cymbal pads. 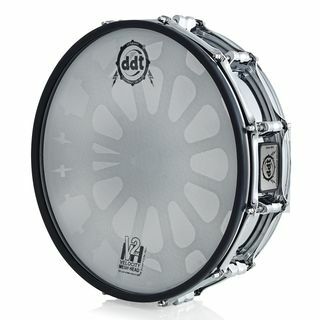 We also offer the right E-Drum hardware & accessories in our E-Drumshop. If you want to turn your acoustic drums into a hybrid set that combines acoustic drumming with electronic drum sounds, you'll find what you're looking for here. Triggers are attached to the shell or head of the drums in order to control almost any sound module with the signals they deliver. The sounds of the sound module can then either be mixed with the acoustic drums or even replace them completely. A simple vocal monitor is simply not enough to hear your drums in the rehearsal room and on stage with the right power. That's why there are special drum monitor systems that deliver all frequencies from ultra low to brilliant treble in a way that really makes playing fun.